The St. Vital Victorias are pleased to announce they have hired Ric Bender as their new Head Coach. 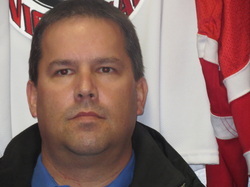 Ric comes to the Vics organization with over 26 years coaching experience. “I’m looking forward to the challenge presented to me this year”, stated Bender. The Victorias are happy to welcome Ric to their organization. The Junior Vics held thier Award Dinner on Wed. May 8 at the Greendell Community club. In addition to the club awards that were given out , three former players, Garnet Wilbon, Jayson Nickol and Travis Davidson as well as builders Al and Wendy Riel were inducted into the Victorias Hall of Fame. Also awarded were the team and League scholarships and finally the team said farewell, and thank you to it's five graduating players. This scholastic award was set up to help MMJHL players continue their education, and is in memory of the Fort Garry Twins Anthony McLauglin , upon his untimely death in May 2000. The award is funded by Mr. Jack McLauglin and family. The 2012-2013 award winner is Charlie Pogue of the Fort Garry Twins. The Nick Hill Memeorial Scholarship , was set up by his family in Nick's memory. Nick Hill was an avid supporter of Winnipeg hockey and of the MMJHL. The team also said goodbye and thank you to the five graduates this year. Thanks Guys, and best wishes in your future endevours!! The Victorias Year end awards dinner will be held Wed. May 8 at the Greendell Community Club, 75 Woodlawn Ave. at 6:00 PM . Please contact Dwayne Joseph for more information at 204 470-9432. The 2012-2013 season ended for the boys Tuesday Night at St. Vital Arena with a 3-2 loss to the Charleswood Hawks. The Vics players,coaches ,staff and executive would like to thank their fans for the support during a long and difficult season, and hope you all have a terrific summer! The team will lose goalteder Brent Wolfe,Defenceman and Captain Mark Goerzen, Defenseman Kevin Trapmore, Forward and Asst Captain Tim Hook and Forward and Asst. 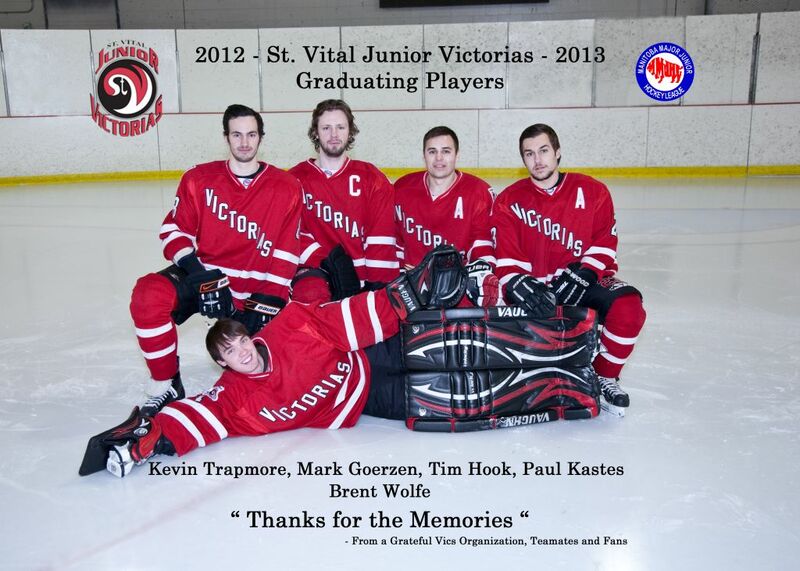 Captain Paul Kastes as graduating players. The Vics organization would like to wish them all the best in their future endevours. Also, a very special Thank you to the parents rep for the last three seasons, Mr. Bill Hook. Your help has been very much appreciated Bill. We look forwrd to seeing everyone again in September and dont forget to check the website every once and a while during the summer for any team news! Have a good - and safe-summer!! The Vics dropped their third in a row to the Hawks Sunday night at Eric Coy Arena by a score of 8-1. Cory Yeroschak and Brody Warren each had two goals, while Brett Harvie,David Lafleche,David Taylor,and Mitchell Hansen had singles. Dylan Brako replied for the Vics. Brent Wolfe stopped 43 shots for the Vics while Lucas Felbel stopped 26 shots in the Hawk goal. The Hawks lead 4-1 after one and 7-1 after two. NOTES: The series returns to St. Vital Arena on Tuesday, March 12 for game 4 and if necessary will go back to Eric Coy for game 5 on Friday, March 15. The St. Vital Victorias lost 4-3 to Charleswood and now trail the Hawks 2-0 in the MMJHL Quarter Final series "A". The Vics opened the scoring when Mike Moore put one past Lucas Felbel one minute and two seconds into the game. The Hawks tied the score one minute and forty four seconds later when David Taylor scored. The score was tied after one at 1-1. The Hawks Riley Court scored at 9:04 of the second as the Hawks took a lead that lasted until 17:16 when the Vics Jared Neufeld scored to even it again. The second ended 2-2 . The Hawks Cory Yeroschak scored at 10:52 and the Jesse Toth scored on a nice single effort to make it 4-2. The Vics didn't give up and Mike Mootre tallied his second of the night at 18:30. Brent Wolfe looked sharp again in the Vics goal stopping 39 Hawk shots while Lucas Felbel stopped 28 shots for the Hawks. The Vics took five minor penalties with each team taking 2 coincidental minors. The Vics dropped the opening game of the MMJHL series "A" to the defending league champions, the Charleswood Hawks by a score of 5-2. The Hawks Dillon Smith opened the scoring at 4:35 of the first period, as the Hawks took a 1-0 lead after one. David LaFleche made it 2-0 at 2:38 of the second and it wasn't until 18:27 when the Vics Tyler Pchajek put one by the Hawks Lucas Felbel. The Hawks maintained their lead after two periods by a 2-1 margin. With The Hawks David Taylor in the penalty box serving a minor for elbowing, the Vics Paul Kastes scored a power play marker to even the score at two at the 11:55 mark. However with 7:16 remaining in the third period the Hawks Dillon Smith scored his second of the night and the eventual winner. Brody Warren tallied for the Hawks with an insurance goal at 17:32 and Beau Zelenewich scored an empty net goal at 19:01. Brent Wolfe stopped 38 shots for the Vics while Felbel stopped 23 for the Hawks. NOTES: Game 2 is Thusday night at St. Vital Arena, Game three at Eric Coy in Charleswood while Game 4 is back at St. Vital Tuesday, March 12. 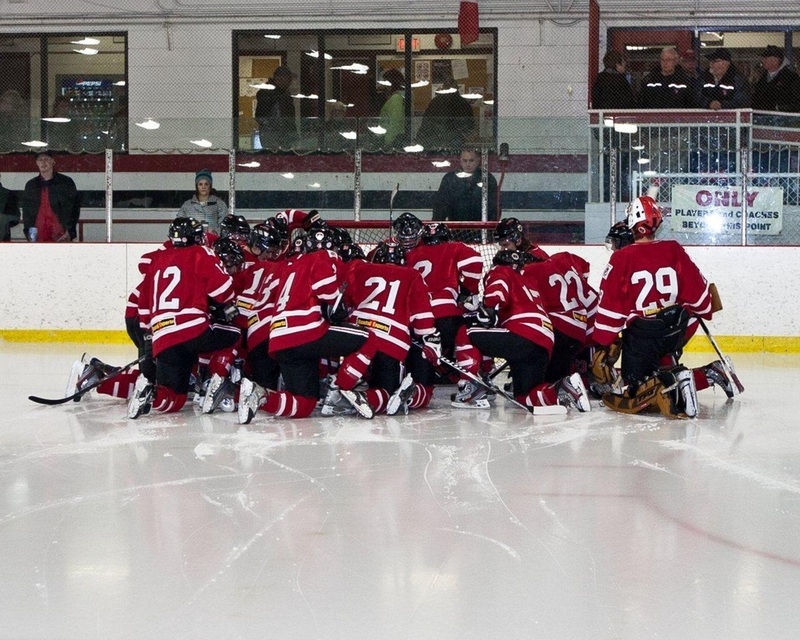 The Charleswood Hawks defeated the Victorias 3-1 Sunday night at the Eric Coy arena. Jesse Toth lead the Hawks with two goals while Cory Yeroschak added a single. Tim Hook replied for the Vics. Brent Wolfe stopped 51 Hawk drives while Lucas Felbel stopped 31 in the Hawks net. NOTES: The Vics finished the season with a record of 19-22-4 for a total of 42 points. They ended up taking the last playoff spot in 8th place. They will take on the Hawks in the first round of the playoffs, which starts this Tuesday, March5 at Charleswood's Eric Coy arena. Game 2 is slated for Thursday, March 7 at St. Vital Arena. The St. Vital Victorias closed out the 2012-2013 home schedule with a 6-3 win over the Transcona Railer Express Thursday night . Tyler Pchajek lead the Vics with a two goal performance while Kevin Trapmore,Danick Levesque,Dylan Brako and Michael Moore added singles. Brent Talling ,Paul Yuriy and Mason Gibson replied for the Railer Express. The Vics outshot the Express 40-21. Erik Pion recorded the win for the Vics while Curtis Champagne took the loss for Transcona. NOTES: The Vics close the regular season this Sunday in Charleswood then open the playoffs against the defending league champion Hawks on Tuesday, March 5th again at Eric Coy arena. They are at home Thursday March 7th for game two. 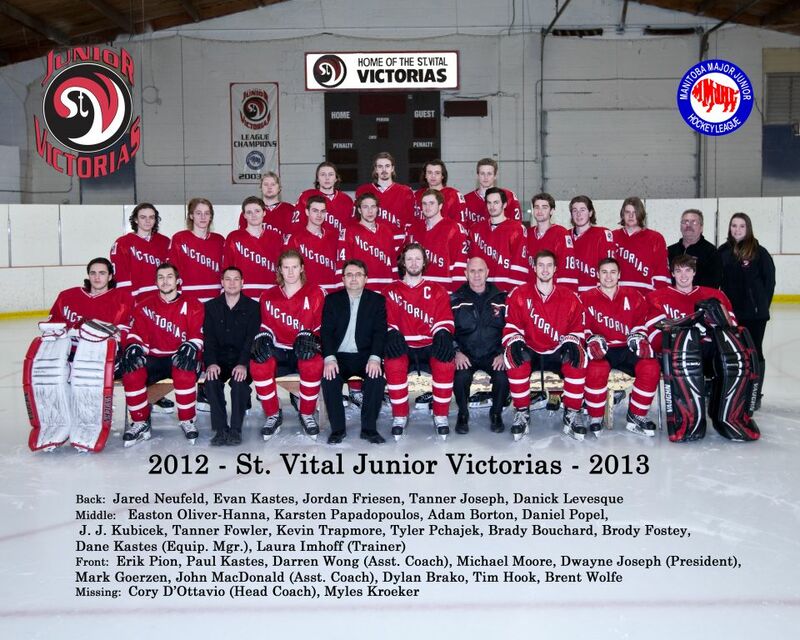 The St. Vital Victorias lost their third in a row Sunday night in St. James , by a score of 4-3. St. James took a commanding 3-0 lead in the first period on goals by Riley Flynn, Austin Hill and Josh Kuzak. Kuzak got his second of the night and the eventual winner early in the second when the Vics finally found the net. Tyler Pchajek,Brody Fostey and Dan Popel scored for the Vics and it was 4-3 after two periods. With no scoring in the third the final was 4-3. St. Vital outshot the Canucks 46-38. NOTES: The Vics are now 4-6 in their last ten games and will host Transcona on Thursday at St. Vital Arena to close out the home schedule and then go to Charleswood to take on the Hawks in the regular season finale. They will open the playoffs against Charleswood Tuesday, March 5th. The Vics dropped their second game in two nights Thursday when the Raiders came to St. Vital Arena and dominated them , taking a 4-1 decision. The Vics Karsten Papadopoulos opened the scoring at 3:55 on a shot from the point that the Raiders Brett Gagnon had no chance on as he was screened on the play. Cam Hildebrand tied the game at 11:44 and after one the game was tied. Hildebrand then scored what was the eventual winning goal at 16:44 of the second for the only goal of the period. Rob Lazo and Jordan Beardy tallied in the third. The score flattered the Vics as they were dominated by the Raiders this night. NOTES: The Vics are in St.James Sunday Night, then return home on Thursday night to host the Transcona Railer Express. They then close out the season in Charleswood next Sunday against their likely first round opponent , The Charleswood Hawks. The Vics travelled to Stonewall ,Manitoba Wednesday night and were defeated by the Jets 5-4. Robert Smith opened the scring in the first with his second of the year at the 7:35 mark, and the Jets lead 1-0 after one. Paul Kastes tied the game at 3:52 in the second ,but Eric Wallace gave the Jets the lead again at 6:55. Rookie Easton Oliver-Hanna scored his first of the night at 9:00 and then Brody Fostey gave the Vics the lead at the 9:51 mark. The lead didn't last as Bryden Johnson tied the game yet again at 12:41 and the second ended with the teams tied at three. Eric Wallace scored his second of the night and the Jets were back in the lead at 4:16 of the third. Easton Oliver -Hanna replied for the Vics with his second of the night at 13:08 and again the teams were tied. 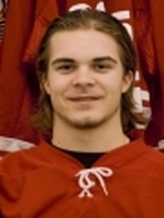 However, with a double minor to the Vics Tanner Fowler for boarding and checking from behind, along with the mandatory game misconduct , the Jets Ryan Miskiewicz scored the winner with 1:13 left in the game. Erik Pion took the loss for the Vics stopping 26 shots, while AP Brendan Schaan seeing his first action of the year made 41 saves for the win. NOTES: The Vics return home to host the Raiders tomorrow night and then travel to the Civic Centre in St. James on Sunday to take on the Canucks. Sunday Night at Century Arena the Vics made the most of their third period chances and downed the Fort Garry Twins 6-3. Dylan Brako lead the Vics with two goals while Tim Hook,Paul Kastes,Jared Neufeld and Kevin Trapmore had singles. Mike Peroff,Nick Doyle and Dustin Bruce replied for the Twins. The game was tied after the first period 2-2 and with Brako's first of the night with 56 seconds left in the second the Vics took a 3-2 lead after two. The Twins tied the game again at 3-3 with Bruce's marker at the 3:02 mark, but after that it was all Vics as they scored three in a row. The Vics directed 35 shots at Mike Newman in the Twins goal, who took the loss. Brent Wolfe in the Vics goal also faced 35 shots taking the win. NOTES: The season series between these two teams was suprisingly close the Twins taking the series 3-2, with two of their victories coming in overtime. The Vics even with the huge win were unable to pass any teams in the standings even though its very close between St. James (43 points) River East (42 points) St. Boniface (41 points) and the Vics (40 points) . The Vics have one game in hand over all these teams. Looks like another tight finish as the teams jockey for position in the standings over the last two weeks of the schedule. The Vics Are in Stonewall Wed. night to take on the Jets, then return home to host the Raiders Thursday night. 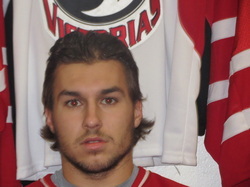 Rookie Danick Levesque lead the Vics to a much needed 6-1 victory Thursday night over the Stonewall Jets. Levesque tallied two goals and three assists while Brody Fostey had two gaols and one assist. Brady Bouchard and Dan Popel also scored for the Vics. Barrett Schlag replied for the Jets. Erik Pion stopped 22 shots in the Vics goal, but looked very sharp, making some very good saves. NOTES: It will be a busy week for the Vics as they go to Fort Garry Sunday night to take on the Twins and then on Wednesday they travel to Stonewall for a return engagement with the Jets. Then on Thursday Feb 21 they are back home to take on the Raiders. The Vics lost their second game in two nights when the Pembina Valley Twisters demolished them 8-3 Friday night in Morris,Manitoba. The Twisters Jory Coates opened the scoring at the 6:40 mark of the first and Christian Savard made it 2-0 one minute and forty-five seconds later. Dylan Brako scored his 8th of the season at 13:02 and the Vics trailed 2-1 after the first. The second period just stated when Tim Hook notched his 22nd of the year just 19 seconds into the period. Rookie Tanner Joseph scored his 8th of the season at 16:35 and the Vics lead going into the third 3-2 inspite of being outshot at that point 29-23. Poor Brent Wolfe, he was left alone in the third facing 39 shots. His teamates must have left early to avoid missing the bus back to Winnipeg. At any rate, the Twisters took full advantage and Bret Heselwood tied the game for the Twisters at 6:47 and after that the floodgates opened. Brett Seymour , Jordan Barnes , Connor Sisson and Barnes again scored all within three minutes and fifty-six seconds.Jeff Bartel closed out the scoring at the 17:00 mark. The Twisters outshot the Vics 68-30. NOTES: The Vics host Stonewall on Valentines Day , then take on the Fort Garry Twins Sunday, Feb 17 at Century Arena. The St. Boniface Riels dropped the Vics Thursday night at the St. Vital Arena 5-2. The Riels were lead by the trio of Kyle Voiriot, Yanik Tetrault and Jens Giesbrecht who either scored or assisted on the Riels first three goals. Voiriot netted the first two while Tetrault scored the third. Giesbrecht assisted all three. Chris Prejet and Glen Young scored the other Riel goals , while Tyler Pchajek and Kevin Trapmore scored for the Vics. Vic Notes. The Vics travel to Morris to take on the Twisters Friday Night . With the victory, the Riels leapfrogged the Vics in the standings and are one point ahead, but the Vics have one game in hand. 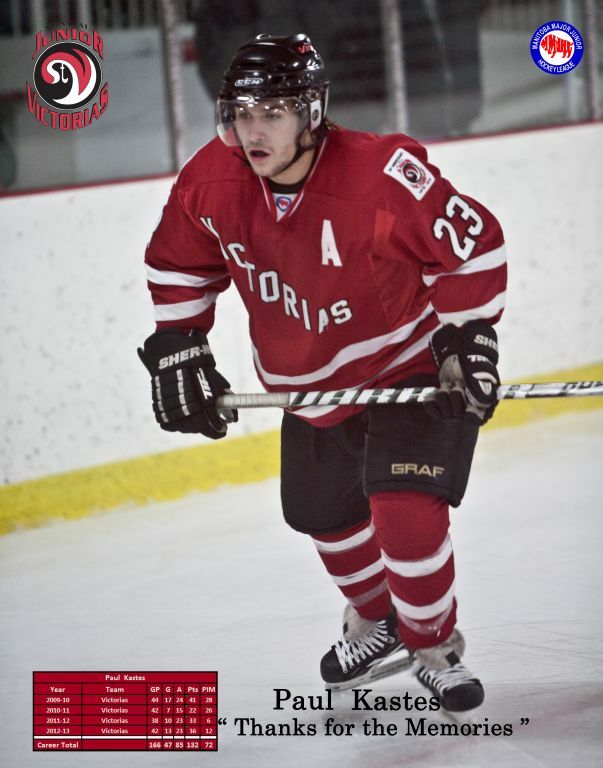 Veteran Dylan Brako came up big for the Vics on a rare Tuesday night game at the old barn Tuesday night. Brako scored two goals and two assists as the Vics downed the River East Royal Knights 6-3. The Vics power play was instrumental in the win as they scrored three power play goals. Other point getters for the boys were Brody Fostey with one goal and two assists , Danick Levesque one goal and one assist, Jared Neufeld with one goal and Brady Bouchard scoring an empty net goal with one second left in the game. Even winning goaltender Brent Wolfe was credited with an assist on Bouchard's marker. Tanner Fowler ,Dan Popel and Tim Hook also had assists.Michael Harper,Jesse Klym and Jory Jastrzebski replied for the Royal Knights. VIC NOTES, The Vics evened their record at 16-16 -2 with the win. They also passed both the Royal Knights and the St. Boniface Riels in the standings. The Riels lost to Charleswood Tuesday Night at Eric Coy Arena. Looks like another exciting finish in the MM this year as teams jockey for playoff position. With the assist, Tim Hook is again in the lead for the scoring race with 51 points , one more tha the Raider's Mike Lazo and the Canucks Cam Fehr. The Vics next game is tomorrow , Thursday, Feb. 7 at home against the St. Boniface Riels. Game Time is 7:30 pm. They then travel to Morris, Manitoba the next day for a game with the Pembina Valley Twisters. The Victorias finally ended their longest losing streak this year by dropping the Transcona Railer Express 3-1 Thursday night at the St. Vital Arena. Tylaer Pchajek opened the scoring at the 5:07 mark of the first period. Tim Hook scored his 21st of the season on a power play goal at 19:44 of the first. Brody Fostey scored for the Vics at 5:59 of the second as the boys took a 3-0 lead after two periods. The Railer Express got their only goal from Reed Van Alstyne at 12:00 of the third. The Vics Brent Wolfe stopped 24 shots to take the win, while Curtis Champagne was solid in the Transcona net, but took the loss. VIC NOTES: The Boston Pizza player of the game for the Vics was Jared Neufeld, who turned in a very good performance tonight and had an assist on Pchajek's goal. The Railer Express player of the game was goaltender Curtis Champagne who was sharp in the Transcona net. Congratulations to Jared and Curtis. The Vics next take on the River East Royal Knights on a rare Tuesday night game on Feb 5. They then take on The St. Boniface Riels next Thursday Feb 7. Game time both nights is 7:30 pm. The Riels currently are one point ahead of the Vics in 7th place, the Vics have one game in hand. Raiders defeat Victorias Sunday at Billy Mo. The Raiders defeated the Vics Sunday night at Billy Mosienko Arena 5-2 to extend the Vics losing streak to five games. The Raiders were lead by Mike Lazo who tallied twice in the first period along with Nicholas Loepkey as the Raiders lead 3-0 after one period. Michael Moore scored the only goal of the second period, and in the third Ryan Magalas and Eric Hansey scored for the Raiders while Brady Bouchard scored for the Vics. Erik Pion started for the Vics, and was replaced by Brent Wolfe in the second while Brett Gagnon took the win for the Raiders. Pion took the loss. VIC Notes: With the latest loss the Vics have now dropped to 8th place in the standings. This Thursday they play host to the Transcona Railer Express, the on Tuesday, Feb 5 the River East Royal Knights come to the Arena. The home stand continues on Thursday Feb 7 as the St. Boniface Riels will be the opposition. The Charleswood Hawks came to the old barn on a blustery snow blown Thursday night and left with their 30th win of the season by downing the Vics 4-0. The Hawks were lead by their "Boston Pizza Player of the game " Riley Court who scored the winning goal at the 6:43 mark of the second period . Court also added two assists. Cory Yeroschak also had one goal and two assists for the Hawks, while Nick Demski and Benji Micflikier also scored. The Vics were outshot 40 - 15 and if it wasn't for the play of the Vics "Boston Pizza player of the game" Brent Wolfe, the score would have been much worse. VIC NOTES: The Vics now have lost four games in a row, and their home record is now 8-6-3. The Victorias travel to Billy Mosienko on Sunday, Jan 27 to take on the Raiders. They then close out January with a home date on Jan 31 against the Transcona Railer Express. The boys only have 12 more games this regular season. The St. James Canucks downed the Victorias in an shootout ThursdayNight at the old barn. The Canucks were lead by six different scorers , Josh Kazuk,Jordan Miller ,Eric Eronen,Jesse Antonyshen,Jesse Oullette and Cory Wilkes. The Vics also had six different scorers , Mark Goerzen,Tim Hook,Brady Bouchard,Evan Kasrtes,Easton Oliver-Hanna and Danick Levesque. The Vics lead 4-3 after two periods, but the Canucks came roaring back in the third to take the lead at 5-4 with Oullette's goal at the 7:19 mark . The Vics tied the game with Oliver-Hann'a marker at 12:49. The Canucks again took the lead at 17:42 with Wilkie's goal, making it 6-5. Not to be outdone Mr. Levesque tied the game with 1:43 left in the third to make the score 6-6. The five minute four on four overtime didn't solve anything , except give the Canucks goaltender Erik Swar a chance to shine as he stopped four Vic shots on the OT. It was off to the shootout where the Vics Brady Bouchard started by scoring on Swar, while Brody Fostey and Tim Hook were foiled by Swar and the Canucks Kendall MacDonald and Jesse Oullette were stymied by the Vics Brent Wolfe before the Canucks Cam Fehr finally put one by Wolfe on the Canucks last chance, forcing another round. The Vics Kevin Trapmore was stopped by Swar and then Jesse Antonyshen ended it by slipping the puck under Wolfe for the deciding goal in a 7-6 final score. Wolfe ended up stopping 40 Canuck Shots, many of the difficult variety while Swar stopped 35 for the Canucks , like Wolfe, many excellent stops. 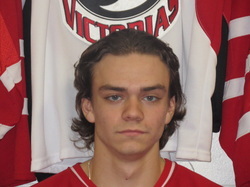 VIC NOTES: Brady Bouchard was the Boston Pizza player of the game for the Vics with one goal and two assists. No surprise Jesse Antonyshen was the Canucks player of the game. The Vics are off until next Thursday, Jan 24 when the Charleswood Hawks come to the old barn. 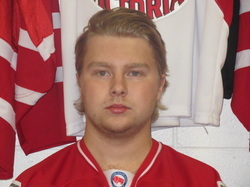 Tim Hook was selected to the MMJHL first team All Stars . He will be joined at the All Star Game on Saturday,Feb. 2 2013 at the Billy Mosienko Arena by three more Victorias, Mark Goerzen,Brody Fostey and Paul Kastes. Congratulations to Tim,Mark,Brody and Paul. Well done guys!! The two All Star Teams this year will be named in honour of two long standing and valuable members of the MMJHL family that we lost this year. 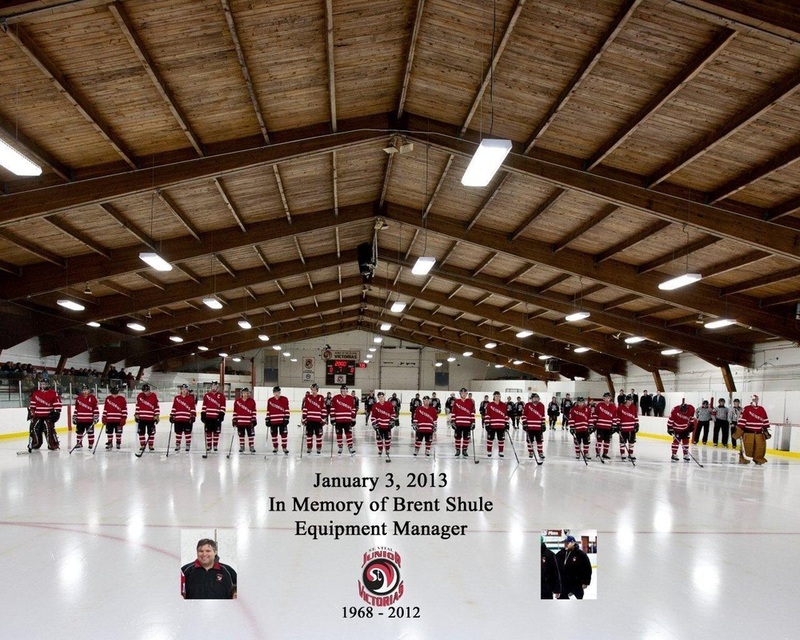 The Vics will play for "Team Shule" named for our own Brent Shule , our long serving equipment manager , who we lost unexpectedly over the Christmas holidays. The boys have dedicated this season to Brent's memory. "Team" Rempel is named after Dale Rempel , a key member of the group that relocated the Pembina Valley Twisters to Morris, MB. Dale lost a long battle with cancer on October 5, 2012. Dale and Brent will always be remembered as well respected gentlemen. The Vics also would like to acknowedge the Raiders Jr. hockey team for suggesting the two All-Star teams this year be named after Brent and Dale! The St. Vital Jr. Victorias would like to welcome Cory D'ottavio and Darren Wong to the coaching staff . The St.Boniface Riels downed the Vics Tuesday Night t the Souhdale Rec Centre 5-3 . The Vics started strong, taking a 3-0 lead after one on the strength of goals by Tanner Fowler,Brody Fostey and Danick Levesque. The Riels then scored five unanswered goals , lead by Chris Prejet , who scored a natural hattrick in the second period. Mackenzie MacGuffin and Brian Dies also scored for the Riels. Nolan Bray of the Riels was credited with trhe win after relieving Kyle Vandemosselaer after the first period. 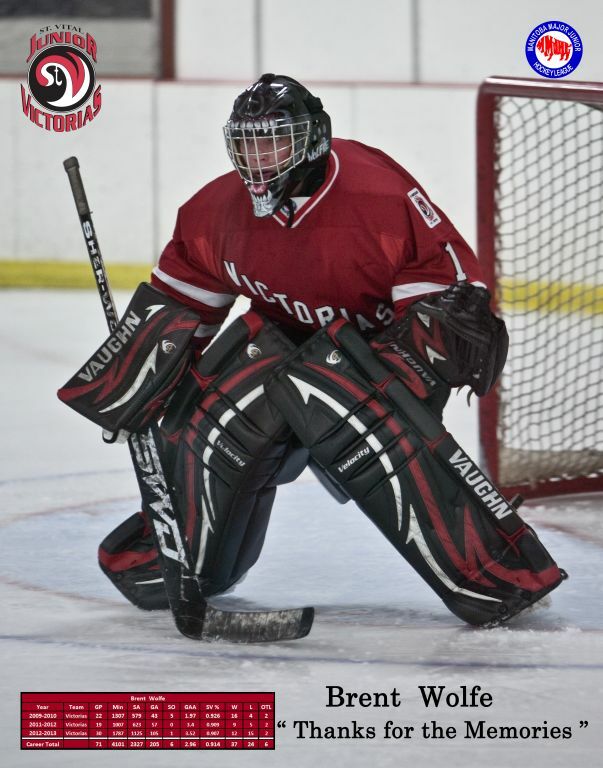 The Vics Erik Pion took the loss stopping 28 shots. VIC NOTES: The Vics are at home Thursday night to take on the St. James Canucks, hoping to stop the two game losing skid. Game Time is 7:30 pm. In a big game Sunday at Terry Sawchuk it was the Royal Knights that emerged as the winner with a 3-2 win over the Victorias. The Vics Brody Fostey opened the scoring at the 7:32 mark of the first period. The Royal Knights Brendan Piche tied the game one minute and 31 seconds later and it was 1-1 after the first. The Royal Knights took the lead for good in the second with goals by Daniel Giles and Kyle Lee , and took the lead at 3-1 after the second. Brady Bouchard scored for the Vics at the 16:38 mark of the third, but that was all the Vics could muster even with Brent Wolfe pulled for the extra attacker. Wolfe stopped 39 shots and was hung with the loss, whilw Shaun Gerbinski took the win stopping 27 shots. VIC NOTES: The boys are at Southdale Rec Centre Tuesday night to take on the St. Boniface Riels and then on Thursday night are back at the old barn to take on The St. James Canucks . The Vics Brady Bouchard now has 11 goals and 8 assists in 12 games since returning to the Vics lineup earlier this year. 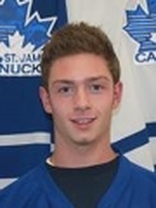 Tim Hook is now tied for the MMJHL scoring lead with the Raiders Mike Lazo and the Canucks' Cam Fehr. Another Vic aquisition , Brody Fostey has 24 points in 21 games. VICS JUMP TO BIG START THEN DROP 2ND PLACE TWINS!! Thursday Night at the old barn was a wild one, where the Vics jumped out to a 5-0 lead after 12 minutes into the first period ,then went on to defeat the 2nd place Fort Garry Twins 7-3. 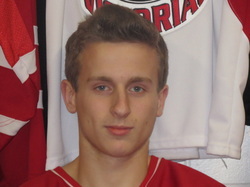 The Vics were lead by Brady Bouchard who scored two goals and two assists. Other goal scorers for the Vics were Tim Hook, Evan Kastes, Paul Kastes,Easton Oliver -Hanna,and Kevin Trapmore. Brody Fostey chipped in two assists. For the Twins, Matt Vis,Andrew Kaminski and Dillon Acheson. Brent Wolfe stopped 35 shots to record his 9th win , while Charlie Pogue stopped 37 Vic drives taking the loss for the Twins. VIC NOTES: The Vics have a huge week ahead of them. They are in River East Sunday,Jan 13 to take on the Royal Knights, then on Tuesday, Jan 15 they are at Southdale Rec Centre to take on the St. Boniface Riels. Then they return home on Thursday, Jan 17 to take on the St. James Canucks. All three teams are chasing the Vics in the standings and its a good opportunity for the boys to put some distance between them and these teams. 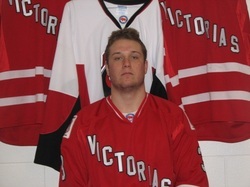 Congratulations go to the Vics Tim Hook for being named the MMJHL Player of the Month for Dec 2012. Time scored 3 goals and 8 assists in 5 games to lead all MMJHL scorers. Well Done Tim!! The Jr. Victorias edged the Transcona Railer Express Sunday afternoon at the Ed Golding arena 2-1. Mark Goerzen and Kelby Minshull scored for the boys with Minshull recording the eventual winner at 4:28 of the third period. Mitch Ainley scored for the Railer Express. Erik Pion recorded the win for the Vics, while Curtis Champagne took the loss for Transcona. The Railer Express outshot the Vics 37-34. Thursday Night was a difficult Night as the Jr. Vics remembered their long time equipment Manager Brent Shule with a moment of silence before the game with the Twisters. The Twisters outgunned and outshot the Vics this night taking a 5-2 victory. Tyler Peers lead the Twisters with three goals, with Mark Hildebrand and Tyler Groening scoring singles. Brady Bouchard and Tim Hook scored for the Vics. Alcide Grenier made 24 saves to record the win and Brent Wolfe was far busier , stopping 38 Twister shots. Below is the notice of Brent Shule's passing , from the Wheatland Chapel in Killarney, Manitoba. Kid Sport Manitoba; 145 Pacific Ave.
Manitoba, achieving a Master’s degree in Actuarial Mathematics. Brent touched many lives and will be sadly missed by his family and all with whom he worked and cheered. 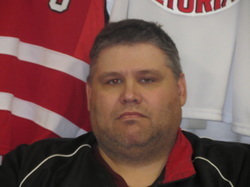 The St. Vital Junior Victorias are deeply saddened to announce the sudden and unexpected passing of their Equipment Manager , Brent Shule. Brent had been with the club for eight years. Victorias Christmas Hamper Drive a success! This years Christmas hamper drive was a big success as the boys were able to deliver five hampers to very appreciative families. The hampers were stuffed to the brim due to the very generous donations given by the families this year and the fact that we had over $500.00 contributed which includes a $200.00 contribution by the team. With the money, we were able to add to the food contributions by purchasing emough turkeys and Hams and everything else you can imagine to make great breakfasts,lunches,and dinners during the holiday season. The staff and executive would like to thank the Victoria players for doing the legwork, delivering the hampers and a very special thanks to Bill and Diane Hook for coordinating the effort! Hey Coach, Can you give the Victoria fans your thoughts and perspective on your team just past the mid point of the season ? As I look back on the first half of the season I see a team that is very tight knit and a hard working group. I also see a group of young men who seem to be coming together as a unit. Although we have far to go, I see this team as having the potential of causing most teams in the league some concern. The one thing as a coaching staff that we could almost certainly count on is being competitive in every game we play. We , as a coaching staff look forward to the second half of the season with a hard working ,dedicated team. We are looking forward to improving continually, and making a good playoff run. And on behalf of my family and the Vic's coaching staff , Jeff Ross and John McDonald, we would like to wish everyone a very Merry Christmas and A Happy New Year! Friday, Dec 21 was a huge day for the Vics and their fans! First they upset the Raiders 6-3 at Billy Mosienko AND the Mayan prediction of the world ending didn't happen! (tongue firmly planted in cheek. ) Anyway, at the old hockey game , Ryan Seekings opened the scoring for the Raiders ,while Tyler Pchajek and Brody Fostey replied for the Vics . The Vics lead 2-1 after the first period. Mackenzie Richardson evened the scoring at the 49 second mark of the second period, and after that it was the Vics that took over, with Paul Kastes , Danick Levesque,and Kelby Minshull scoring as the boys held a 5-2 lead after two. Cole Cassie scored for the Raiders in the third and Tanner Fowler ended it all with an empty net goal at 18:49. Brett Gagnon stopped 32 Vic shots taking the loss while Brent Wolfe was solid for the Vics, stopping 32 shots for the win . Wolfe is now 8-7-1 . VICS NOTES: As the Vics enter the Christmas Break they are tied for fifth place with the River East Royal Knights, with identical 12-11-3 records. Tim Hook is tied for the scoring lead with the Raiders Cam Hildebrand. The Vics players,staff and executive would like to thank their fans for their support and wish everyone a Merry Christmas, and Happy Holidays!! The Vics lost their last home game of the year to the Charleswood Hawks 6-2 Thursday night. Cory Yeroschak lead the Hawks with two goals and an assist earning him the "Boston Pizza Player of the Game for the Hawks. Mike Lorange scored two goals also , while Nic Demski and Brody Warren had singles. Brady Bouchard and Tim Hook replaied for the Vics, with Bouchard named the Vics player of the game with a goal and an assist. VIC NOTES: The Vics last game of 2012 is Friday, Dec 21 vs the Raiders at Billy Mosienko. After that they will break for the Holiday season starting up again on Jan 3rd at home vs the Pembina Valley Twisters. Brady Bouchard and Tim Hook lead the Vics in a 9-3 walloping of the St. James Canucks Sunday night at the St. James Civic Centre. Bouchard had three goals and two assists for five points. Not to be outdone, veteran Tim Hook had 1 goal and four assists for five points. Other Vic goals came from Paul Kastes with two, Tanner Joseph,Tyler Pchajek and captain Mark Goerzen. Matt Garvey and Matt Scherger scored for the Canucks. Brent Wolfe claimed the win stopping 39 Canuck drives while Cameron Sass and Jared Allison combined to stop 34 Vic shots ,with Sass taking the loss. VIC NOTES: The Vics now have only two games before the MMJHL holiday break. This Thursday,Dec 13 at home they host the Charleswood Hawks . This will be the last chance to contribute to the Vics Christmas hamper drive!! Then on Friday Dec 21 they travel to Billy Mosienko to take on the Raiders. It was a big night for the Vics, with the Victory they leapfrogged over the Canucks in the standings and now hold fifth place, one point more than the Canucks. 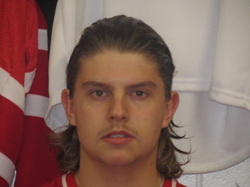 With his five point effort, veteran ,and Asst captain Tim Hook is presently leading the MMJHL scoring race with 38 points, one more than the Raiders Cam Hildebrand and Mike Lazo. Brady Bouchard is also hot, scoring six goals and three assists for nine points in six games. The boys dropped the Stonewall Jets 5-3 Thursday Night at the arena. Kevin Trapmore,Easton Oliver -Hanna,Paul and brother Evan Kastes each had one goal with Brady Bouchard scored the other marker. Tyler Lodge with two and Nick Papaioannou accounted for the Jets scoring. The Vics Brody Fostey continues to be a valuble member of the Vics, notching three assists.He has recorded eight goals and eleven assists since joining the club. Brent Wolfe stopped 20 Jet shots to record the win, his sixth of the year, while Luke Sirant stopped 33 Victoria shots taking the loss. VIC NOTES: The Vics are now 10-10-3 over the season for 23 points. They are 7-3-2 at home and 3-7-1 on the road. There are three games left before the Holiday break, one at home, next Thursday, Dec.13 vs the Hawks and this Sunday, Dec 9 Vs. St. James , closing out next Friday, Dec 21 Vs. the Raiders at Billy Mosienko. There is still time to contribute to the VICS CHRISTMAS HAMPER DRIVE!!! We will be collecting non perishable food or cash the Thursday Dec 13 game vs. the Hawks. Any and all contributions are greatly appreciated! See you at the Barn!!! It was a wild one Sunday night at Century Arena as the Vics lost in a shootout to the Fort Garry Twins 8-7 . The Vics had seven different goal scorers, Brody Fostey,Tanner Joseph,Brady Bouchard,Tim Hook,Paul Kastes,Dan Popel and Mark Goertzen. Kevin Trapmore had a good night contributing three assists. The Twins were lead by Garrett Desmond scoring two goals (and then the winner in the shootout) and Jeremy Yocum with two goals. Nick Doyle,Matt Wilson nd Andrew Kaminski also scored for the twins. Referee Trevor Peluk called only seven minor penalties, but they were very costly , there were six power play goals four by the Twins and two by the Vics. The Twins directed 66 shots at the Vics Erik Pion, who took the OT loss and the Twins Charlie Pogue and Mike Newman combined to stop 46 shots. The Vics downed the St. Boniface Riels 4-1 Thursday night at the St. Vital Centennial Arena. Tim Hook, Kevin Trapmore,Dylan Brako and Evan Kastes scored for the Vics , while Brad Kutzak spoiled Erik Pion's shutout bid , scoring with 1:24 left in the game. Pion looked solid , stopping 36 Riel shots to record his third win of the season, while Kyle Vandemosselaer stopped 24 Vic shots taking the loss. On a rare Tuesday night home game at the old barn, the PV Twisters came in and downed the boys 5-3 . Brett Seymour and Tyler Peers scored for PV as they took a 2-0 lead after one period. The Vics Brody Fostey scored a natural Hat Trick with goals at 1:30,5:25 and the 10:44 mark of the second. Ryan Maynard scored for the Twisters as the score was tied after two periods 3-3. Marcus Siemens scored the eventual winner , short handed, at the 11:42 mark and Kevin Coulombe sealed the deal with an empty net marker at 19:48. The Vics Erik Pion looked sharp in goal for the Vics stopping 43 Twister drives, while Alcide Grenier had only 18 drives directed his way to pick up the win. The Vics dropped another road game Friday night in East Kildonan, as they were on the short end of a 4-3 decision to the River East Royal Knights at Terry Sawchuk Arena. The boys now slipped to 3-7 on the road. Stefan Kosior,Cam Kilpatrick,Andrew Kossack and Garrett Shymko tallied for the Knights. Shymko's power play goal at 4:02 of the third was the winning goal. Scoring for the Vics was Jared Neufeld,Brady Bouchard and Dylan Brako. Brent Wolfe made 29 saves for the Vics, taking the loss while Shawn Gerbinski stopped 36 Vic shots to record the win. VIC NOTES: The Knights have now taken the first three games of the season series between these two teams. With last nights loss the boys are now in 8th place, however, between 4th and 8th there is a two point difference. Yes Victoria, Santa is a Vic! The Jr Vics are continuing the tradition with their annual Christmas Hamper Drive to give a helping hand to a few families that could use it. Please see the attached letter from Mr. Bill Hook , the Vic's parents Rep.
the next 3 home games scheduled for November 27, 29 and December 6, 2012.
by now sells the 50/50 tickets. prior to delivery. Any parents interested can let me know by return e-mail. the hampers please don’t hesitate to contact me. The Vics ended their two game losing skid by dropping the expantion Transcona Railer Express Sunday afternoon at the Ed Golding Arena in Transcona. The Vics were lead by veteran Tim Hook, scoring two goals and an assist. Another vet, Kevin Trapmore scored one goal and two assists. Matt Ainley scored a single , while rookie Karsten Papadopoulos scored his first two MMJHL goals (both on the power play), including the eventual winner at 15:38 of the second stanza. Erik Pion stopped 35 shots for the win, while Derek Kitching and Zachary Blank combines to stop 30 shots with Kitching taking the loss. VIC NOTES: The Vics have a break now, but continue their road games Friday, Nov 23 at Terry Sawchuk , taking on the River East Royal Knights. They then return home for two games, to close out November. Tuesday,Nov.27 vs. the Pembina Valley Twisters, and then Nov 29 vs. the St. Boniface Riels. The Vics travelled to Seven Oaks Friday night to take on the Raiders , but did not have the end result they were looking for. They started out well at one point in the second period leading 4-0 , on goals by Kelby Minshull, Kevin Trapmore , Easton Oliver -Hanna , and Tyler Pchajek. Rob Lazo scored the first Raider goal at 16:10 of the second, and it was all downhill for the boys when Jordan Lisowick,Cole Cassie with two and Mike Lazo scoring the winner with 1:10 left in the third. The Raiders out shot the Vics 40-33. VIC NOTES: The boys continue away games when they take on the Transcona Railer Express on Sunday afternoon, the have a little break until Friday, Nov. 23 when they take on the River East Royal Knights. The Charleswood Hawks downed the St. Vital Victorias 2-1 in a close game that went to the wire Thursday Night at the old Barn. The Hawks' David Taylor opened the scoring atr the 0:25 mark of the second period, and the Vics Paul Kastes evened the score when he poked home the puck after a wild goal mouth scramble. Doug Lawrence scored the winner at 13:56 of the third. Brent Wolfe was the Vics Boston Pizza player of the game stopping 29 of the Hawks 31 drives. David Taylor was the Hawks player of the Game . VIC NOTES : The Vics have three consecutive away games now, Nov 16th at Billy Mosienko against the Raiders, Nov 18th at Transcona and the 23rd at Terry Sawchuk against the River East Royal Knights. They then close out November with two home games , the 27th vs. the Pembina Valley Twisters and the 29th against the St. Boniface Riels. 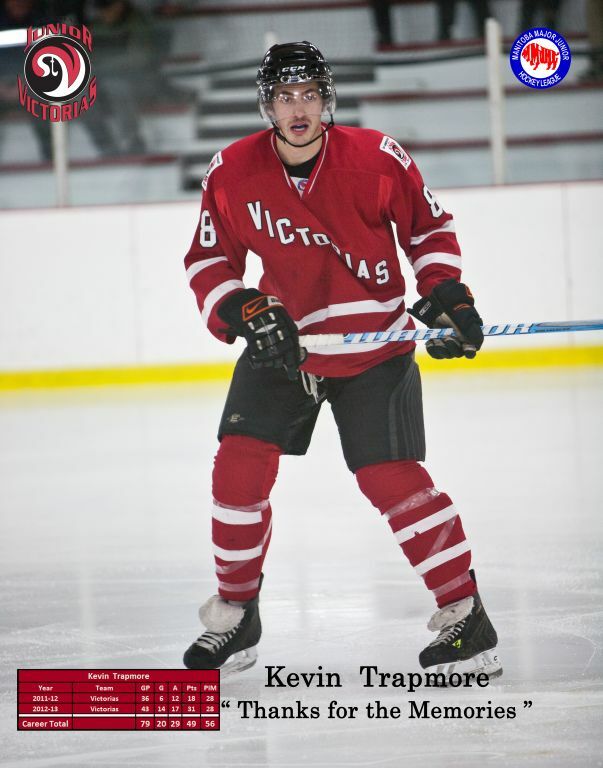 Veteran Kevin Trapmore lead the Vics, scoring two goals and an assist , over the St. James Canucks Friday Night at the St. Vital Centennial Arena. Tim Hook also had two goals and an assist for the boys. Evan Kastes,Brody Fostey and Tyler Pchajek had singles. Cory Wilkie,Morgan Winchar and Matt Scherger scored for the Canucks. Brent Wolfe had his second consecutive win , while Erik Swak recorded the loss for the Canucks. VIC NOTES: With the win, the boys are now tied with the River East Royal Knights for 5th place. Their home record is now 5-1-2. The Charleswood Hawks come to St. Vital on Thursday to take on the Vics . Game time is 7:30 pm. The boys travelled to Stonewall , Manitoba Sunday night to take on the Jets and came away with a 6-1 victory. The Jets Brett Harvie opened the scoring at the 2:44 mark of the first, but after that it was all Vics. Brodie Fostey lead the Vics with 2 goals and an assist. Other Vic marksmen were Tim Hook,Kevin Trapmore , Easton Oliver- Hanna and Kelby Minshull.Brent Wolfe took the victory stopping 36 Jet shots and chipped in an assist. Luke Sirant took the loss stopping 29 shots. The Fort Garry Twins came the St. Vital Thursday night and left with a shootout win. The Vics were down 3-0 after one period ,thanks to the Twins Dustin Bruce,Brett Fargher,and Jeremy Yocum who each scored a goal. With no scoring in the second , the boys came roaring back in the third with goals by Jared Neufeld,Tim Hook and Kelby Minshull who scored the tying goal with 0.6 seconds left in the third. After a five minute overtime, which didn't settle anything the teams went to the shootout. The Twins Peter Logan got the puck past Brent Wolfe for the Twins Victory. Wolfe stopped 46 Twin shots, but took the loss while the Twins Charlie Pogue stopped 28 Victoia shots for the win . Vics head coach Steve Fouquette was pleased that his charges did not quit in the third, coming back to tie the game and forcing overtime , even though the final result was not what they planned. VIC NOTES: The boys travel to Stonewall on Sunday ,Nov4 to take on the Stonewall Jets. Then return to the St. Vital arena on Friday, Nov. 9 th to take on the St. James Canucks. The Boston Pizza player of the Game for the Twins was Brett Fargher , who scored a goal, an assist and a goal in the shootout to lead the Twins. Kelby Minshull was the Vics player of the game with his last second heroics. The Vics downed the St. Boniface Riels 4-2 Sunday Night at the Southdale Recreation Centre to record their first road win of the year. Recent aquisition Brody Fostey lead the boys with a goal, the eventual winner , and an assist. Matthew Ainley ,Tanner Fowler , and Kevin Trapmore also scored for the Vics. Royce Nixdorf and Brett Saelens scored for the Riels. Erik Pion stopped 21 Riel shots to record the win, and Nolan Bray took the loss for the Riels stopping 32 of 37 Victoria drives. VIC NOTES: The Vics leapfrogged not only the Riels with the win, but the Pembina Valley Twisters , who do have a game in hand. While its early in the season, it looks like tight race is forming in the standings and each game is important! The Vics next action is this Thursday at St. Vital Arena, vs the always strong Fort Garry Twins. Game time is 7:30 They then travel to Stonewall on Sunday ,Nov 4 to take on the Jets. Game Time in Stonewall is 8:00pm . Goaltender Brent Wolfe was stellar in the Vics goal on Thursday night leading the boys to a 3-2 win over the Pembina Valley Twisters. Wolfe stopped 38 of 40 Twister shots , many of the difficult variety , leading his team to the much needed win. Tyler Pchajek, with his first opened the scoring at 7:19 of the first period. Paul Remillard tied the score at 9:13 of the third, Then rookie Easton Oliver-Hanna scored his third of the year , a power play marker at 15:49 of the third. The Twisters never quit and Conner Sisson scored a power play goal for PV tying the score at two at the 16:18 mark. Not to be out done ,the boys replied with Dan Popel scoring the winner at the 18:29 mark , again , on the power play. The Vics coaches Steve Fouquette and Jeff Ross were very pleased with the effort, as the Vics always had an answer for the Twister goals. VIC NOTES: JJ Kubicek left the game in the first with an upper body injury. For his heroics, Brent Wolfe was the Boston Pizza player of the game and was awarded a certificate for an eight inch gourmet pizza compliments of Boston Pizza. Connor Sisson was the player of the game for Pembina Valley. The boys are now 4-1-1 on home ice, but still looking for that first road win , they are 0-5-0 on the road. The 50-50 winner was Tony Mazza, Tony won $55.00 . Congratulations Tony, and the Vics would like to thank everyone that supported them by purchasing 50-50 tickets. The Vics now travel to Southdale Community Centre on Sunday, Oct. 28 to take on the St. Boniface Riels. Then they are at home next Thursday Nov. 1 to take on the Fort Garry Twins. Game is 7:30 pm both nights. The Vics are still looking for that elusive first road win of the season, now 0-5-0 after losing to the River East Royal Knights at Terry Sawchuk on Sunday night. Scoring for the Vics was Dylan Brako with his third of the year and Evan Kastes recorded his first tally of the year. Kelby Minshull scored his third of the year to bring the Vics to within one with 8:04 left in the third. Thats as close as the boys would get to the Knights. Scoring for the Knights was Cam Kilpatrick,Nolan Weselak,Kyle Lee and Garrett Shymko with his fifth of the season recording the eventual game winner. Shaun Gerbinski stopped 32 of 35 Vic drives , while Brent Wolfe returned to the Vics net stopping 31 of 35 shots. VIC NOTES: The boys are at home for a match against the Pembina Valley Twisters on Thursday, Oct 25. then go to Southdale Community Centre on Sunday Oct 28 to take on the St. Boniface Riels. Game Time both nights is 7:30 PM. The Vics downed the Transcona Railer Express 9-2 Thursday at the old barn. Kevin Trapmore lead the Vics with two goals and singles were from Kelby Minshull,JJ Kubicek, Mark Goerzen,Dylan Brako,Jared Nuefeld,Jordan Friesen and Paul Kastes. Don Gale and Tango Yestrau replied for the Railer Express. Curtis Champagne looked good taking the win , stopping 18 of 20 Railer Express Drives. Denzel LeBlanc and Zack Blank combined to stop 35 of 44 Vic shots. The St. Vital Victorias regret to announce that Head Coach and GM Kevin Martynuik has left the team citing personal reasons. Steve Fouquette and Jeff Ross will handle the coaching duties in the interim. The Defending champion Charleswood Hawks defeated the St. Vital Victorias on Sunday night 5-3. The Vics lead after two periods on the strength of JJ Kubicek's first , Mark Goerzen's first and Tim Hook's seventh of the year. Kyle Krzyaniuk and Riley Court scored for the Hawks. In the third, Dillon Smith scored for the Hawks to tie the score and 30 seconds later Sean Kubas scored the eventual winner. Kubas had an insurance marker in the empty net at 18:41. Lucas Felbel stopped 14 Vic shots to record the win, while the Vics Erik Pion made 29 saves taking the loss. Referee Ryan Galley only had to call two minor penalties during the game, one to each squad. VIC NOTES: The boys record has slipped to 2-5-1 and they are still looking for their first road win of the year, they are presently 0-4-0 on the road. This Thursday they take on the expantion Transcona Railer Express at the old barn , then travel to Terry Sawchuk on Sunday, Oct 21 to take on the River East Royal Knights. VIC NOTES: The Vics are in Charleswood on Sunday to take on the Hawks and then return home next Thursday to take on the Transcona Railer Express. The boys went to St. James to take on the hi flying Canucks on Tuesday night , but things didn't work out as planned. The boys were dropped by the Canucks 5-2. Things started well with Tanner Fowler scoring his first of the year at 6:40 of the first. Rookie Easton Oliver-Hanna notched his second of the year at the 7:00 mark and the boys were up 2-0. The Canucks roared back with Matt Garvey and Cam Fehr scoring twenty-four seconds apart to tie the score before the end of the first. In the second, league scoring leader Jesse Antonyshen scored his eighth goal of the young season and the Canucks never looked back. Cam Fehr scored two goals to register the hat trick and the final score was 5-2 with no scoring in the third. The Canucks Erik Swar stopped 25 Vic shots to record the win, while Eric Pion took the loss stopping 28 Canuck drives. The St. Vital Victorias downed the Stonewall Jets Thursday Night at the St. Vital Arena 7-1 on the strength of veteran Tim Hooks' four goals and an assist night. Hook now has 6 goals and six assists this season. Michael Moore with his first of the year , Paul Kastes with his second and Tanner Joseph with his fifth of the season also scored for the Vics. Brett Harvie scored his second of the year for the Jets. Brent Wolfe recorded his second win of the season stopping 27 of 28 Jet drives, while Luke Sirant took the loss stopping 21 of 28 Victoria shots. Tim Hook with his five point night was named the "Boston Pizza " player of the game for the Vics and Brett Harvie was the recipient of the Jets player of the game. Both players received coupons for an 8 inch personal pizza compliments of Boston Pizza. The Victorias would like to thank Boston Pizza for their support. VIC NOTES: The Boys evened their record at 2-2-1 and are in St.James on Tuesday Oct. 9 to take on the Canucks. Next home game is Thursday, Oct 11 vs. the Raiders. Game time both nights is 7:30 PM . With his five point effort Tim Hook now leads the MMJHL scoring with 12 points, while rookie Danick Levesque is tied for second with the Twins veteran Mark Tomlinson. The Victorias players ,staff and management would like to wish everyone a Happy Thanksgiving!! Sunday Night at the Century Arena the home team Twins soundly defeated the Jr. Vics 6-3. The Twins ,on the strength of two short handed goals from Jeremy Yocum and Dustin Bruce, and outshooting the boys 49 to 20 easily handled the Vics. James Bergal with two goals, Garrett Desmond and Mark Tomlinson also tallied for the Twins. Rookie Tanner Joseph lead the Vics with two goals , his 3rd and fourth of the season.Veteran Paul Kastes notched his first of the year. Charlie Pogue stopped 17 shots to record the win, while the Vics Brent Wolfe was far busier stopping 43 of the 49 Twin shots. Wolfe is now 1-2 on the season. VIC NOTES: The boys are home on Thursday to take on the Stonewall Jets, then travel to St. James for a game with the Canucks. While the Vics are presently sitting in seventh spot in the standings, there is some good news, rookie Dannick Levesque is tied for the scoring lead with nine points in four games and veteran Tim Hook sits in 5th with seven points in four games. The River East Royal Knights downed the Vics 6-5 in a shootout Thursday night at the St. Vital Arena. Jesse Klym scored the only goal in the shootout for River East while Ryan Grossmueller was outstanding the in Knights goal stopping 41 Victoria shots . Jordan Barnes lead the Knights with two goals while Kyle Lee, Simon Miller and Jory Jastrzebski chipped in singles. An excellent effort by rookie Dannick Levesque who scored four goals and an assist was for naught with the folding act in the third period. Tim Hook scored the other Vic goal and had three assists. The Vics were up 3-0 at 6:26 of the second period but let up and the Knights responded with a spirited comeback. VIC NOTES The Vics are now 1-1 with an overtime loss for three points. Coming up Sunday they take on the Twins at Century Arena, Game time is 7:30 PM . Next at home are the Stonewall Jets on Thursday, Oct. 4. Game Time is 7:30 PM . On Sunday afternoon the Vics visited Morris and were dropped by the hometown windstorm 5-2. Penalties played a big role in the Vics downfall as the Twisters scored four power play goals. Brian Dies opened the scoring at 5:19 of the first and the Vics lead 1-0 after the first. The twisters Matt Mazinke evened the score at 12:18 of the second (on a power play goal)and after two periods the score was tied at one. Things opened up in the third, with Christian Savard scoring at the 2:51 mark (the only full strength goal allowed ) and Ryan Maynard scoring another power play goal at the 5:30 mark. Tanner Joseph notched his second of the season at 7:15 to bring the boys back to within one, but Jory Coates, and Paul Remillard scored power play goals to seal the deal for PV. Brent Wolfe was busy in the Vics goal stopping 41 shots and evened his record at 1-1. Jordan Taylor stopped 24 of the Vics 26 drives to record the W.
VICS OPEN NEW SEASON WITH CONVINCING WIN OVER THE RIELS!! The Jr Victorias opened the 2012-2013 season with a convincing 5-0 victory over the St. Boniface Riels. The two teams started tentatively with no score after the first two periods. The boys blew things open in the third with rookie Easton Oliver-Hanna opening the scoring at the 46 second mark . Veteran Tim Hook scored at 2:43 and the Vics were off to the races. Rookie Tanner Joseph scored his first of the season at the 9:08 mark followed by vets Brian Dies and Dan Popel to close out the route. Brent Wolfe stopped 17 shots for the shutout and the win. Nolan Bray took the loss for the Riels stopping 34 shots. The boys gave head coach Kevin Martynuik a nice birthday present with the win, but they made him wait, as the game was close going into the third period! Happy Birthday Kevin! SEASON OPENER THURSDAY, SEPTEMBER 20 , 2012 VS. THE ST. BONIFACE RIELS. ST. VITAL ARENA @ 7:30 PM!!! The St. Vital Victorias 2011-2012 season was officially wrapped up on April 25th with the year end dinner which included the Victorias Hall of Fame inductees, the award winners for the season and the acknowegement of the efforts and contributions of the three graduating players. The Hall of Fame inductees were four very deserving members, three players that were members of the Vics 2003-2004 Championship team. 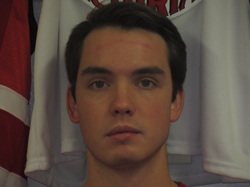 Included in the group are goaltender Justin Carloni, forward Michael Gregg and forward Scott Savage. And in the builders catagory long time executive Mr. Jim Bateman. The Victorias Staff would also like to wish everyone a safe and enjoyable summer! The Stonewall Jets eliminated the Vics Sunday night when they dropped the Vics 5-1. The staff and executive of The Victorias Jr. Hockey club would like to thank the fans for their support this year and also thank the players for their efforts and an exciting season. Special thanks to graduating players Andrew Dunsmore, Dylan Doerksen , and Christian Peloquin. Best of luck to you in your future endevours ! Hoping everyone has a terrific summer and look forward to seeing you again in September! Of Friday night the Stonewall Jets downed the Vics 3-2 with a goal at the 3:16 mark of the first OT period. The Vics lead 1-0 after the first and 2-1 after two. The Jets tied the score with 2:53 left in the third forcing the overtime. Brady Bouchard led the Vics with a goal and an assist. The boys will have to bring their "A" game if they hope to force game seven in the series on Sunday nights game 6. 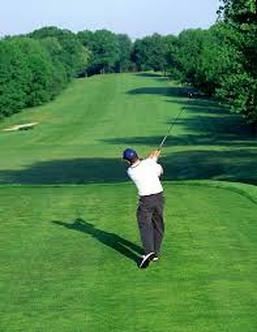 If not, it could be time to bring out the golf and fishing gear. Quarter Final Series now Tied at 2 Games Each!! The series is now tied at two games each as the Vics downed the Stonewall Jets 4-3. Evan Kastes was the Vics "Boston Pizza star of the game" scoring two goals including the winner at 17:43 of the third period. Brother Paul als oscored for the Vics and Tim Hook added his first of the playoffs. Brett Harvie,Danny Stewart and Paul Yuriy scored for the Jets. Brent Wolfe stopped 27 shots for the win while Curtis Vanwalleghem stopped 29 Vic shots taking the loss. Referee Ryan Galley called 8 minor penalties between the teams. As we predicted, it is a long series and the best is to come! 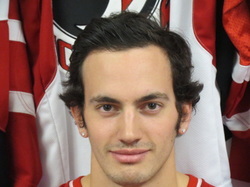 Congratulations go to Brian Dies for being named the Victorias "Super Lube" player of the month for Feb 2012. For his efforts ,Brian is the recipient of an oil change coupon , compliments of Super Lube Auto Centres, Winnipeg. The Victorias would like to acknowledge and thank Super Lube Auto Centres for their support! 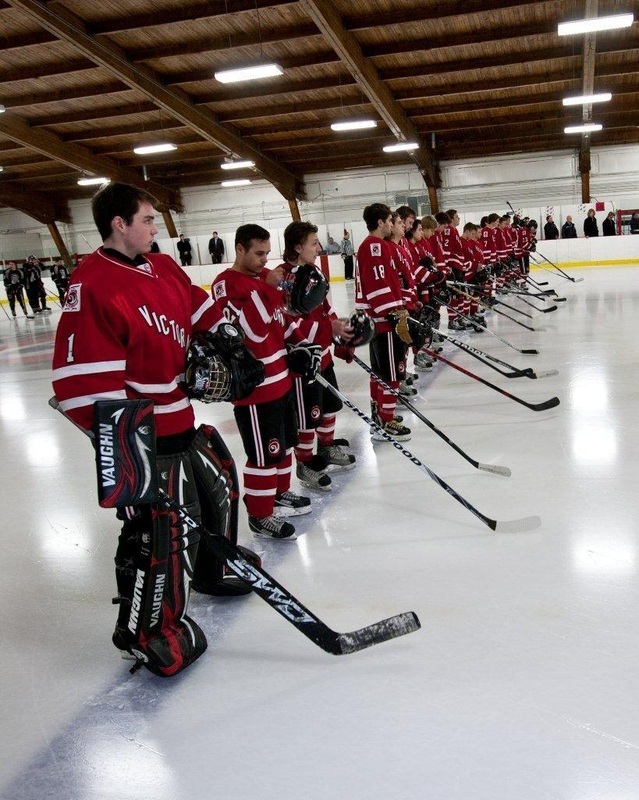 The Vics lost their final game of the 2011-2012 campaign Thursday Night at the old barn to the Seven Oaks Raiders 3-2. The Winning goal was scored by the Raiders Austin Steinberger at the 19:59 mark of the third period when the Vics couldn't clear the puck from their zone while they were shorthanded and Steinberger was able to get the puck over Chistian Peloquin's shoulder for the winner. Cam Hildebrand and Jordan Lisowick also scored for the Raiders while Dannick Leveque and Brady Bouchard scored for the Vics. Chistian Peloquin stopped 38 shots for the Vics and was the Boston Pizza Player of the game for the Vics. Steinberger was the player of the game for the Raiders with his last second heroics. Playoffs start next week, check back for the Vics opponent and schedule for the first round. The Charleswood Hawks convincingly defeated the Victorias on Tuesday night at the St. Vital Arena 6-2. Six different markmen scored for the Hawks, Colin David,Connor Staub,Dillon Smith,Brody Warren,Eric Beaudin,and David Taylor scored for the Hawks, while Brian Dies and Brady Bouchard replied for the Vics. Christian Peloquin stopped 46 shots and took the loss while Lucas Felbel had a quiet night in the Hawks goal stopping 21 Vic shots. The Vics take on the Raiders on Thursday at home to complete the 2011-2012 regular season. The Vics spoiled the Stonewall Jets fan appreciation day by taking an 8-7 victory on Sunday afternoon. They were lead by Kevin Trapmore and Evan Faris (pictured at left) and Dylan Brako who each notched a goal and an assist. Faris's goal was his first of the season. Brady Bouchard,Andrew Dunsmore,Matthew Ainley, Evan Kastes and Tim Hook with the eventual winner also scored for the Vics. Ryan Elliot lead the Jets with a hatrick, Danny Stewart,Brett Harvie,Brock Couch and Kael Peterson also scored for the Jets. With todays win, the Vics take the season series 3-2, with two of those wins on OT! These two teams are very closely matched and could possibly end up first round opponents. Time will tell, The Jets regular season is now over , the Vics have two games this week. The River East Royal Knights downed the Vics in a shootout tonight 4-3. They were lead by Garrett Shymko who scored two goals and the winner in the shootout. Shymko was named the River East Boston Pizza Player of the game for his efforts.Jordan Barnes and Dillon Hockin scored the other RE goals. 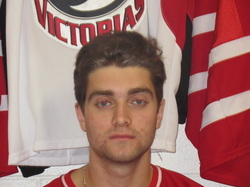 The Vics Bradley Kutzak scored a goal and an assist for the Vics, taking the Vic's Boston Pizza player of the game. Dylan Brako and Brady Bouchard also tallied for the Vics. The boys are down to three regular season games left before the playoffs start. They could end up as high as third position, or as low as 6th. With the two points the Knights now have the last playoff position, two points ahead of the St. Boniface Riels, however, the Riels have two games in hand. Sunday night in Morris Mb. the Twisters defeated the Vics 5-1 to take the season series between the two teams. The Vics Brian Dies opened the scoring for the Vics at 10:46 of the first as the boys took a 1-0 lead after the first. The Twisters Jordan Hintz and Graham Leiding scored in the second as they took the lead 2-1 after two periods. They then took control in the third with Tyler Groening,Marcus Siemens and Ryan Maynard scoring for the 5-1 final. Paul Schram stopped 26 shots to record the win for the Twisters , while Christian Peloquin stopped 32 PV drives taking the loss. The Twisters took the season series 3-2 with one of the Vics wins coming in a shootout. Wednesday Feb. 15, 2012 from 6:00 - 9:00 PM @ the BP located on St.Annes Rd. Come and support the Jr. Vics and enjoy the atmosphere at BP! 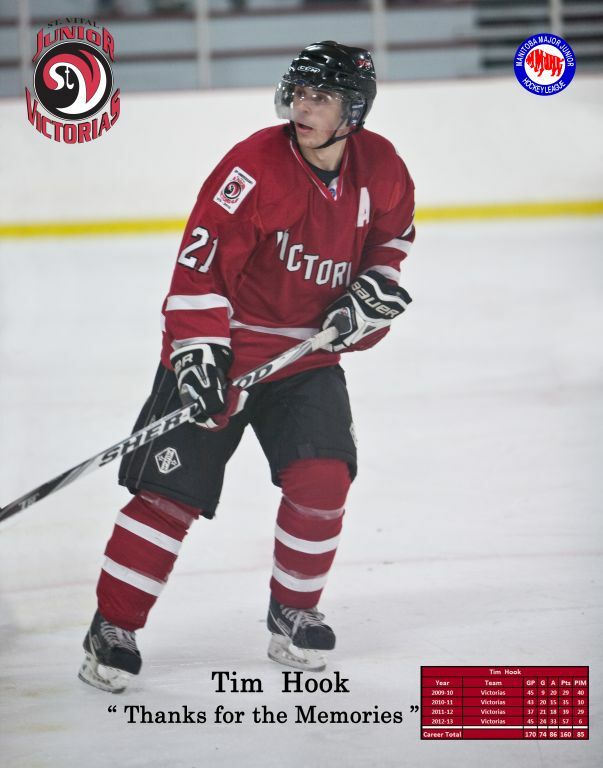 Tim Hook lead the Vics with two goals, including the winner at 0:35 of overtime as the Vics downed the St. Boniface Riels 5-4 Saturday Night. Dylan Brako,Matt Ainley and Paul Kastes also scored for the boys. Brock Bram,Glen Young,Cole Grant and Aaron Contant scored for the Riels, Contant's marker tying the game and forcing OT with 27 seconds left in the third. That simply set the stage for Hook's heroics in overtime. Christian Peloquin recorded the win, stopping 41 saves for the Victorias while Sean Lofto and Kyle Vandemosselaer split the duties for the Riels, with Vandemosselaer taking the loss. With the Victory, the Vics move two points ahead of the Twins and Jets in the race for third. The Riels with the point for the OT loss climb into a tie for the last playoff spot with the Knights. As we said before, its going to be a wild finish in the MMJHL !! Stay tuned! Vics down Canucks on OT! The Jr. Vics downed the St. James Canucks 4-3 in overtime Thursday Night at the old barn. The boys were lead by Dylan Brako and his two goals and one assist ,including the winner at 3:33 of the overtime period. Tim Hook chipped in one goal and an assist, while JJ Kubicek had two assists. 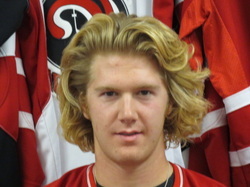 Tanner Fowler scored the other St. Vital marker. The stars of the game were the goaltenders, the Canucks Erik Swar was sharp in stopping 29 Victoria shots, and Christian Peloquin also looked good in the Vics goal stopping 28 Canuck Drives. The Vics needed the two points to keep in the thick of the standing race, they are now tied with Stonewall with six games remaining. The Twins are two points back, with a game in hand, and the Twisters are there too, just four points back with a game in hand. The Vics have a big game Saturday night at Southdale Rec Centre against the St. Boniface Riels. Game time is 7:30 PM See you there!! Tuesday night at Eric Coy Arena the Charleswood Hawks hammered the Vics 6-0. The Hawks' David Lafleche scored at the 00:48 second mark of the first and it was all downhill from there for the Vics. The Hawks scored two goals each period to take the convincing win. The Vics next action is Thursday, back at St. Vital Arena vs. the St. James Canucks. The boys are truly in a logjam in the standings. They are tied for third place with the very hot Fort Garry Twins and the always tough Stonewall Jets. The Pembina Valley Twisters are only two points behind. With only seven games left, it promises to be an exciting finish to the season. The Fort Garry Twins on the strength of Charlie Pogue's goaltending and Keith Mitchell's two goals dropped the Victorias 3-1Thursday night at St. Vital Arena. Mackenzie Atcheson scored the other Twins goal. Evan Kastes replied for the Vics. Christian Peloquin put a strong performance for the Vics in a losing cause stopping 33 shots. Pogue stopped 43 Vic shots including several break aways for the win. Next action for the boys is next Tuesday, Feb 7 at Charleswood, then Thursday at Home vs. the St. James Canucks. The MMJHL standings are getting very tight with the Vics,Twins Jets and Twisters all within four points of each other. Looks like a barnburner finish for playoff positions with only eight games left in the regular season! 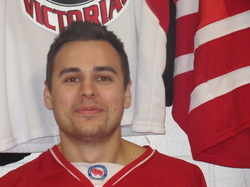 Congratulations go to Daniel Popel for being named the Victorias "Super Lube" player of the month for January 2012. Dan scored 4 goals and 2 assists in 8 games. 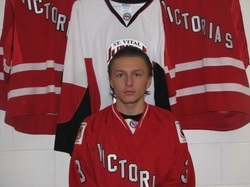 His play this year also had him selected to represent the Vics in this years MMJHL All Star Game. For his efforts ,Dan is the recipient of an oil change coupon , compliments of Super Lube Auto Centres, Winnipeg. Sunday night at Billy Mosienko the Raiders edged the Vics 4-3. Brian Dies opened the scoring and the Vics lead 1-0 after the first. Colton Kalinski ,Mitch Chagnon and Jordan Lisowick scored for the Raiders as they took a 3-1 lead into the third. The Vics fought back with goals by Paul Kastes and Daniel Popel. Mitch Changnon with his second of the night scored the eventual winner for the Raiders at 15:59 of the third. Brett Gagnon stopped 29 Vic drives to pick up the win , while Brent Wolfe took the loss stopping 22 Raider shots. Next action for the Vics is this Thursday at home vs. the Fort Garry Twins. The Twins have been coming on of late and are 8-2 in their last 10 games. Should be a good game! The puck drops at 7:30 pm. See you there! Vics down Stonewall in OT! The Vics downed the Stonewall Jets Thursday night at the old barn 4-3 in overtime. Kevin Trapmore (pictured at left) scored the winner in overtime at 3:20 with his fifth goal of the year. It was a rocket that eluded Jets goaltender Curtis Vanwalleghem. Other scorers for the Vics were Brady Bouchard,Evan Kastes and Bradley Kutzak. Tim Hook chipped in two assists. It was a very clean game with referee Shaun Dalgliesh only calling three minor penalties all night.Brent Wolfe stopped 28 shots in the Vics goal for his eighth victory of the year. Vanwalleghem took the loss for the Jets stopping 29 shots. The Vics next action is Sunday Jan 29 vs. the Raiders at Billy Mosienko Arena. The next home game is next Thursday, Feb 2nd Vs. the Fort Garry Twins. A total of six Jr. Victorias will represent the team at this years MMJHL All Star Game on Saturday, Feb. 4 2012 at Billy Mosienko Arena, 709Keewatin St. 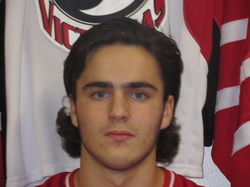 Leading the St. Vital contingent will be rookie and team leading scorer Brady Bouchard. To date, Brady has 14 goals and 20 assists for 34 points. Forward Tim Hook with 17 goals and 12 assists for 29 points and Brett Dudar with 9 goals and 19 assists round out the forwards from St. Vital. 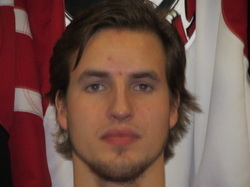 Defenceman and team captain Mark Goerzen will also represent St. Vital. Mark to date has 8 assists on the year. That and his standout leadership and defensive play are the reasons Mark joins the squad. Rookie Daniel Popel rounds out the defenive reps from St. Vital, Dan has 6 goals and 14 assists in his rookie year to date. Friday night at Terry Sawchuck Arena , the Vics defeated the River East Royal Knights 6-3. Evan Kastes lead the boys with a goal and two assists, Brady Bouchard and Dylan Brako each contributed a goal and an assist, while Jared Neufeld Daniel Popel and Andrew Dunsmore into an empty net rounded out the Vics scoring. Matt Lumsden,Kyle Lee and Stefan Koslor tallied for the Knights. Christian Peloquin made 30 saves for the Vics, while Bryan Tait stopped 35 for the Knights. Vic notes: The next game is Thursday, Jan. 26 vs the Stonewall Jets. The Vics are 8-2 over the last 10 games. The Vics are a very mediocre 7-7 at home, but 11-3-1 on the road! Sunday night the Pembina Valley Twisters blew through town and left with two points in the MMJHL standings by defeating the Victorias 4-1. Tyler Groening lead the tornadoes with two goals and an assist. Ryan Maynard contributed one goal and two assists. Tyler Peers added the other PV goal. The Vics Bradley Kutzak with his third of the season ,scored the Vics lone goal. The next action for the Jr. Victorias is Friday, Jan 20 when they travel to Terry Sawchuck to take on the River East Royal Knights. Game time is 7:30 PM. Next Home Game is Thursday Jan 26 vs, the Stonewall Jets. The Vics kept their winning streak alive on Thursday in convincing fashion by dropping the St. Boniface Riels 6-2. Brian Dies opened the scoring at the 2:08 mark of the first period. The first period ended 1-0 but when Jared Neufeld scored at 1:16 of the second period there was no looking back. JJ Kubicek , Brett Dudar,Brady Bouchard and Tim Hook also tallied for the boys, Joel Schreyer and Chris Prejet scored for the Riels. Brent Wolfe was in goal for the Vics stopping 20 shots, while Sean Lofto and Kyle Vandemosselaer combined to make 28 saves with Lofto taking the loss. The Vic's next home game is this Sunday at the old barn, Vs. the Pembina Valley Twisters,always a tough opponent. Sunday night the Vics downed the St.James Canucks in an offensive minded contest 6-5 at the Civic Centre. The Vics were lead by rookie Brady Bouchard with two goals, including the winner with 1:26 left in the third . Brian Dies, Paul Kastes,Brett Dudar and JJ Kubicek also scored for the Vic's. Cam Fehr with two, Nicolaas Den Ouden, Jesse Antonyshen and Matt Scherger replied for the Canucks. The Vics Christian Peloquin in his second consective start stopped 36 of 41 shots to record the win,Erik Swar took the loss for St. James, stopping 31 of 37 shots. It was a very clean contest ,the two teams took a total of five minor penalties. The Vics next action is this Thursday, at home vs, the St. Boniface Riels. Game Time is 7:30 PM. NOW YOU CAN ASK HEAD COACH KEVIN MARTYNUIK ANY QUESTIONS YOU HAVE REGARDING THIS YEARS EDITION OF THE JR. VICTORIAS . THE QUESTION SELECTED WILL APPEAR HERE ON THE WEBSITE. TO FORWARD YOUR QUESTION CLICK ON THE CONTACT TAB ON THE TOP RIGHT OF THE WEBSITE AND FORWARD YOUR QUESTION TO DWAYNE BY EMAIL. IF YOUR QUESTION IS SELECTED, YOU WILL BE GIVEN A PASS FOR TWO TO A REGULAR SEASON VIC'S HOME GAME. The first question for coach Kevin Martynuik is " Coach, can you give us your thoughts of the teams performance during the first half of the season ? Friday night the Vics resumed their winning ways by dropping the Ft. Garry Twins 6-2 Friday night at the Century Arena. Dan Popel lead the Vics with his 4th and 5th of the season. Brian Dies ,Brett Dudar , Brad Kutzak and Andrew Dunsmore also tallied for the Vics. Dunsmore's goal coming at the 19:59 mark of the third period. Peter Logan and Ben Fowler replied for the Twins. Christian Peloquin was sharp in goal for the Vics, stopping 35 of 37 shots, including one that he took of his mask in the third that appeared to shake up the goaltender, but he did complete the game. The Twins Matt Horta stopped 28 shots ,taking the loss. 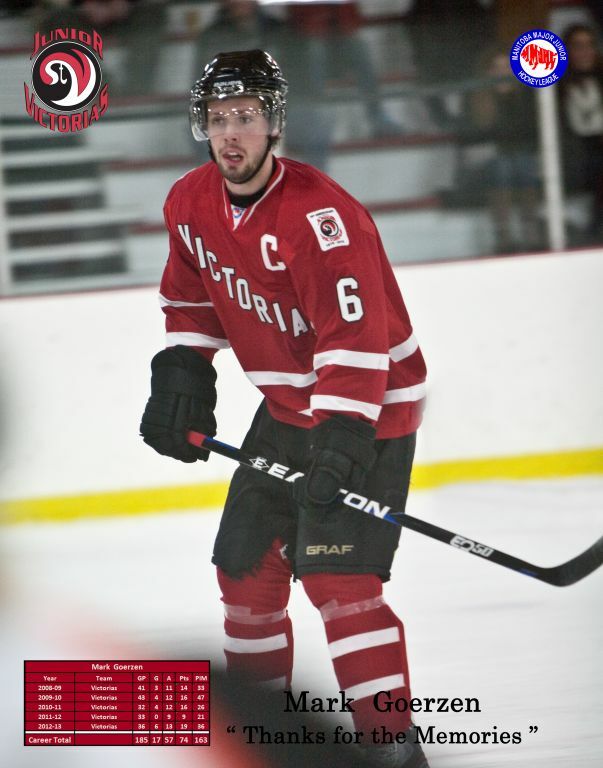 The Vics continue on the road, Sunday night at the Civic Centre against the St. James Canucks. After the lengthy Christmas break, this will be their third game in four nights. They must keep up their winning ways as the Stonewall Jets are in hot pursuit, two points back in the standings. Too much holiday Turkey for the Vics?? The Victoria's six game winning streak is over thanks to the league leading Charleswood Hawks. The Hawks came to the old barn for their first regular season visit and left with a 5-2 victory. The Vics started out well in the first period and opened the scoring on Brett Dudar's sixth goal of the season. After one period the Vics lead 1-0, but the Hawks came roaring back in the second with three goals, from Jack Josephson, Jesse Toth on the power play and Dillon Smith. The Hawk's power play was deadly , going two for three on the night. In the third, Toth scored his second of the night and Nick Demski recorded his third of the season for the Hawks. The Vic's JJ Kubicek recorded his first goal of the season for the Vic's. The boys need to regroup after Thurdays loss, but have to do it fast as they are in Fort Garry tomorrow (Friday ) to take on the Twins. Game time is 7:30PM @ Century Arena. 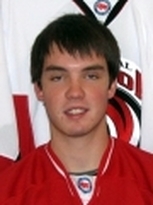 Congratulations go to Andrew Dunsmore for being named the Victorias "Super Lube" player of the month for December 2011. Dunsy tallied 6 points in four games. For his efforts ,Andrew is the recipient of an oil change coupon , compliments of Super Lube Auto Centres, Winnipeg. NOW YOU CAN ASK HEAD COACH KEVIN MARTYNUIK ANY QUESTIONS YOU HAVE REGARDING THIS YEARS EDITION OF THE JR. VICTORIAS . THE QUESTION SELECTED WILL APPEAR HERE ON THE WEBSITE. TO FORWARD YOUR QUESTION CLICK ON THE CONTACT TAB ON THE TOP RIGHT OF THE WEBSITE AND FORWARD YOUR QUESTION TO DWAYNE BY EMAIL. The Jr. Vics have a Yule Tide custom of collecting food for St.Vital Familes that could use a helping hand. This year however , things were handled differently by the team. This is the first year that the players and parents were directly involved in organizing and delivering the Hampers to four very appreciative families. The executive would like to thank the players and parents for taking on this task. It shows that this years team is an exceptional group of people!! 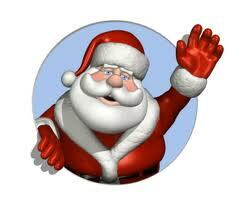 From everyone associated with the Junior Vic organisation, have a very Merry Christmas and a Happy New Year! Vics keep on Rolling , win their sixth game in a row! Down Stonewall 2-1 in shootout! The Boys won their sixth in a row on Friday night , entering the holiday break on a six game winning streak. In the process they defeated the Jets for the first time this season. The Jets Brett Nespor with his 16th of the season opened the scoring at 3:27 of the first period on a power play goal. After a scoreless second , the Vics Brett Dudar tied the score at 9:54 of the third with his 5th of the year. Kevin Trapmore and Tanner Fowler logged the assists. It was a goaltending duel , with the Vics Brent Wolfe working his second game in as many nights looking sharp again stopping 35 shots. The Jets Curtis Vanwalleghem was also sharp stopping 38 of 39 Victoria shots. Brady Bouchard settled the contest scoring on the Vics third attempt. With Sick Bay still full the Vics had to call up three affiliate players for the second night in a row, yet still managed to keep the streak going. 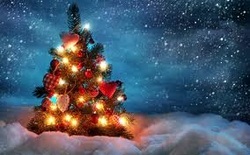 The players ,staff and executive of the Victorias would like to wish everyone a happy holiday season and all the best in 2012! The boys were lead by Brian Dies who had a goal and an assist. Dylan Brako were the other marksmen for the Vics. Nicholas Leoppky replied for the Raiders. in the Vics net stopping 44 of 45 shots. The Vics could only muster 17 shots on the Raiders Brett Gagnon. It was a very fast paced game with only five minor penalties called. donate a "tin for the bin"
Now thats a pretty good deal and its for a worthy cause!!! The Victorias Executive and Staff would like to thank all that attended Fridays Bud,Spud and Steak Night at Cowboys,making it a success! Special thanks go to Mr. Bill Hook (parent rep),Diane Hook, Annette Mitchell, Louise Fontaine, and Katherine Moore. The Vic's won their fourth in a row Sunday night at the old barn , by defeating the River East Royal Knights 4-1. Dylan Brako lead the Vics with two goals and an assist. Andrew Dunsmore chipped in a "Gordie Howe Hat trick" A goal, an assist and a fight. Matt Lumsden replied for the Knights. While facing only 21 shots, Christian Peloquin was very sharp in the Vics net. The Vics, suffering from the injury and flu bug had two affiliate players , Danick Leveque and Kris Melna in the lineup. Head Coach Kevin Martynuik was very happy with the call ups efforts. Hopefully the sick bay will empty soon bringing the club back to full strength! The boys have two games before the Christmas break, Thursday ,Dec 15 at home against the high flying Raiders and on Friday the 16th they go on the road to Stonewall to take on the Jets. Congratulations to the Vics Brady Bouchard for being recognized by the MMJHL as the "Investers Group " rookie player of the month for November. In seven games Brady scored five goals and two assists for seven points and an average of 1 point pre game. Congratulations to Paul Kastes for being named the Vics "Super Lube" player of the month for November. Paul tallied three goals and five assists in seven games during the month. Super Lube Auto Centres , Winnipeg. Congratulations go to Tim Hook for being named the first Victorias "Super Lube" player of the month for October 2011. During late Septmber and the month of October Time scored seven goals and three assists. For his efforts ,Tim is the recipient of an oil change coupon , compliments of Super Lube Auto Centres, Winnipeg. The boys won their third in a row on Saturday night ,in Morris Manitoba ,downing the Pembina Valley Twisters 5-4 in a shootout. The Victorias were lead by Brady Bouchard with 2 goals in regulation and the eventual winner in the shootout. Tim Hook and Andrew Dunsmore were the other Vic's Marksmen. Tyler Peers lead the Twisters with two goals with Tyler Groening and Doug Lawrence also scoring for the Twisters. Paul Schram made 40 saves the Twisters including 7 in OT. Charlie Pogue was in goal for his second consectutive start for the Vics and looked sharp making 35 saves. The game became chippy in the second period as four players were ejected for fighting, as well as several other roughing penalties and misconducts issued. The teams did settle down for the third and overtime setting the stage for the shootout. In the fourth round of shots the Twisters Doug Lawrence missed while Brady Bouchard tallied the winner for the Vics. The Victorias have now reached the midway point of the regular season in third , with 23 points. On Thursday, Dec 1 the Vics upended the St.James Canucks 8-4 at the old barn . They were lead by leading scorer Tim Hook with two goals (one on a penalty shot) and two assists. The Canucks Cody Mymko notched a goal and two assists. Charlie Pogue was solid in the Vic's net making 26 stops. The Vics are now on the road, in Morris to take on the Pembina Valley Twisters , who are two points behind the Vics with a game in hand.